Even though Ansellia orchids are gorgeous, beautiful and easy in cultivation, they are not very well known like Phalaenopsis or Cambria orchids. But they certainly deserve to be more widely known, not only in the circle of orchid enthusiasts. Besides that they are exceptionally fair and beautiful, they are also quite interesting. Ansellia is a monotypic genus, that contains only one currently accepted species (which is, in fact, seems to be complex of very similar species). Ansellia africana, also known as African Orchid, African Ansellia and Leopard Orchid is the only one single species in this genus. 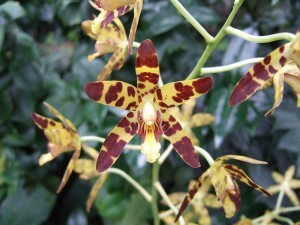 Leopard Orchid is widely used in folk medicine of Africa. In some regions its pseudobulbs and leaves brew is used as antipsychotic drug, in other regions of Africa it is used as emetic, as remedy for a cough, and in Zulu Leopard Orchid is used in folk magic – to prevent ex-lovers from pregnancy by wearing pseudobulbs, and also in love charms and as protection from lightening. In tropical areas Leopard Orchid is highly prized as a garden plant, in warmer regions it can grow outdoors and it can grow to giant sizes, up to one ton weight, becoming a jewel in any garden, attracting hordes of hawk moths to its sweetly scented beautiful flowers. The native lands of this genus include southern parts of Africa and African tropical forests. Ansellia africana is a sympodial epiphyte or sometimes terrestrial orchid from Africa – given the fact that this species is close relative to Cymbidium and Grammatophyllum orchids (and even can be hybridized with them freely) they are large to giant sized. They have pseudobulbs which are long, have many nodes, cane-like and yellowish. Pseudobulbs bear leaves (6-7) in the upper part of the pseudobulb. Leaves are oblong, leathery and plicate. The flowers are highly variable in size, shape, and color, but in general, flowers are up to three inches wide, yellowish green to intense yellow with purple to brown spots, giving them leopard-like pattern (hence the name “Leopard Orchid”), some flowers can be entirely brown in color. You can collect a collection of different samples of one species – and they will have different flowers, so though Ansellia is a monotypic genus, it can be a collector item. There are also alba clones and yellow clones of this orchid, which are also quite lovely and beautiful. Flowers are born on mature pseudobulbs in many-flowered racemes in the apical parts of pseudobulbs. Flowers are fragrant. Mature plant in full blooming with many flowering pseudobulbs is truly marvelous and spectacular seeing. The flowers are born in spring and winter, but a mature plant with many pseudobulbs, with sufficient light intake, can flower in any part of the year, especially if you provide it with some drought period for two-three weeks of reduced watering. Ansellia orchid is quite easy in cultivation. Maybe the most challenging part in the cultivation is light requirements. Leopard orchid will not bloom if the light is insufficient, so you should observe your plant to know –if it is bright enough. Leaves and pseudobulbs should be yellowish in color; if they became intense green you should know that light is insufficient. Watering and fertilizers should be ample until new pseudobulb matures, but take it, as a rule, to allow the substrate to dry between watering because overwatering is dangerous for Leopard Orchid. Some give the advice to grow African Ansellia in baskets to allow air freely contacts with roots. As it becomes mature, you should reduce watering and give the plant a dry period (in nature Leopard Orchid is extremely drought-tolerant and can tolerate drought quite easily) – this would be a signal to plant to bloom. Temperatures should be warm to hot, so they fairly well grow indoors. The substrate should be as for terrestrial orchids with more bark. Interesting fact about Ansellia is if they have insufficient Nitrogen intake, they start to grow white, needle-like roots upwards (so-called “trash basket roots”) to catch some organic debris, so if your Ansellia orchid produced such roots it should be a signal to increase Nitrogen and start using fertilizers. If you in a tropical area and grow outdoors you should consider that Leopard orchid can grow to giant sized plant, so you should choose an appropriate tree for mounting this orchid, because a weak tree can simply break under the weight of mature Ansellia specimen. Also, you should consider protection from excessive sunlight, even though this orchid loves bright light, in nature, it grows in forests and takes not very much direct sunlight. And in the garden, it is also quite easy to grow, and it can quickly become large, robust specimen which is very ready to bloom with its beautiful, fragrant flowers.